Grrrrr. This now very embarrassing because after i pushed the build to my server and published the release post I found 2 major regressions who make editing fxgraph-Files fairly tedious. I also had a problem with my release script for the 3.7.0 version where I packaged the 0.0.9 version of e(fx)clipse instead of 0.0.10. So I decided to make another release 0.0.11 which fixes the regression and the packaging. Sorry if this caused trouble to you but this simply slipped through my checks. For those who already downloaded the broken 0.0.10 release I’m sorry but you should redownload version 0.0.11 (it also includes one new feature). The keyword has been already part of the language but now its semantics are fully implemented. 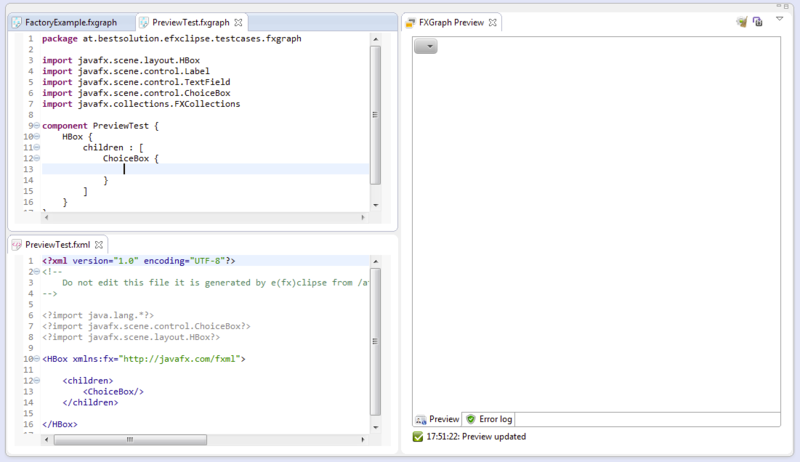 You can now prefix an attribute in your FXGraph-File with preview and so the content is only passed to the preview but not into the serialized file. I added this feature because sometimes it is necessary to fill controls with data to see how their layout changes. A good example in this sense is the ChoiceBox who layouts itself according to its content. subclipse is not latest one. Why not include the 1.8.4? There’s no org.tigris.subversion.clientadapter.svnkit.feature.feature.group in the 1.8.4 win64 anymore. The javahl is integrated even in x64. I don’t have a linux to run you sh. So I think remove org.tigris.subversion.clientadapter.svnkit.feature.feature.group should work. The plugins you integrate is actually the plugins I’m using. Just m2e miss. Yet, it doesn’t matter. I can install it myself. But I have to remove the old subclipse and install again. And the legacy plugins in the plugins folder are never removed by the uninstallation. 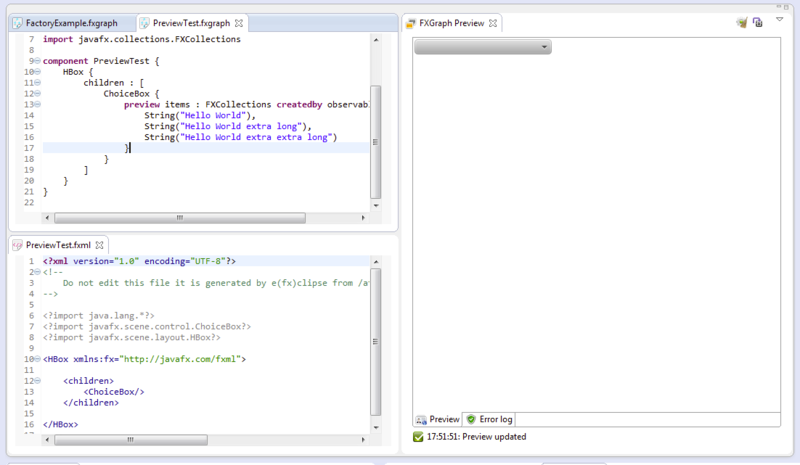 And for 1.8.4 you should integrate org.tigris.subversion.subclipse.graph.feature.feature.group as well. I have looked into this and the problem is that 1.8.4 is not cross-platform. I could now package the 1.8.x for win32 and 1.6.x for all other operating systems but I decided to stay away from this until subclipse provides cross-platform support through svnkit. According to their site support for newer SVN-Versions is coming in Feb so I decided to wait for 0.0.13 or 0.0.14.
fxml fragment didn’t made it through the comment system. Can you send me your fxgraph and expected fxml file or fragment? fixed in master – 0.0.12 will have support for this. The usage looks like this: https://github.com/tomsontom/e-fx-clipse/blob/master/at.bestsolution.efxclipse.testcases.fxgraph/src/at/bestsolution/efxclipse/testcases/fxgraph/ScriptTest.fxgraph. 0.12 is scheduled for January, 22nd 2012. I guess the only way until then is to init in a controller. Thanks, I’ll wait for the new version!